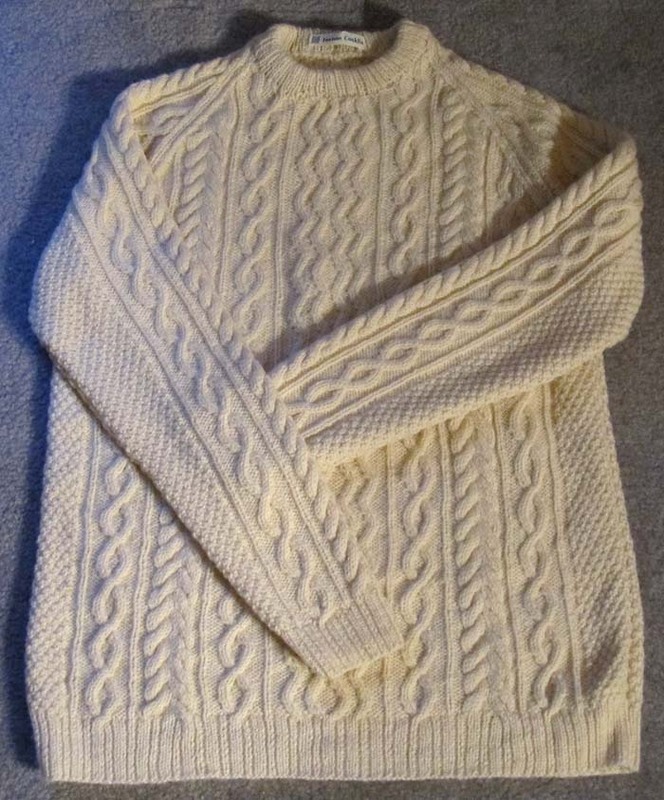 The Carmichael Aran has actually been finished for a few weeks, but it was only this morning that I got around to taking a picture. The picture isn't that great, but it gives you an idea of how it turned out. I'm hoping that Dennis, the recipient, will send me a better photo. One of my plans for the new year is to spend more time with my camera and learn what it, and I, can do. The sweater pattern is mine and I used tratitional cables. Since Mr. Carmichael lives near the ocean I used a wave-like pattern in the center. I made the sweater with raglan sleeves for two reasons: Dennis mentioned liking raglan construction when the sweater was first discussed, and I prefer a raglan shaping as it cuts down on the bulk under the arms that you get with a drop-shoulder. Notes: I blocked the pieces of the sweater before sewing them together and each seemed to grow dramatically in length. However, after I sewed it all together and the sweater "rested", the lengths were right. Now, I hope that the sweater fits Dennis and that he likes it. I hope that the lengths are what he was hoping for. That really is beautiful. I like your tip about blocking the pieces before sewing. My sweater may be saved. Joanne, that is absolutely beautiful! You really did a great job! Gorgeous! You did a beautiful job! What a lovely sweater you designed and such a great job of knitting it. Beautiful!